There comes a time in every young boy’s life when he wants to try to catch something. Sometimes it’s a bug, other times it’s a leprechaun, but more recently my young boy, Bobby, has been talking about catching a fish. So, after much debate about what the first experience should be like whether it should be out at a pond, or part of a camping trip, my husband and I decided to take the easy option. We went to a trout farm to go fishing. 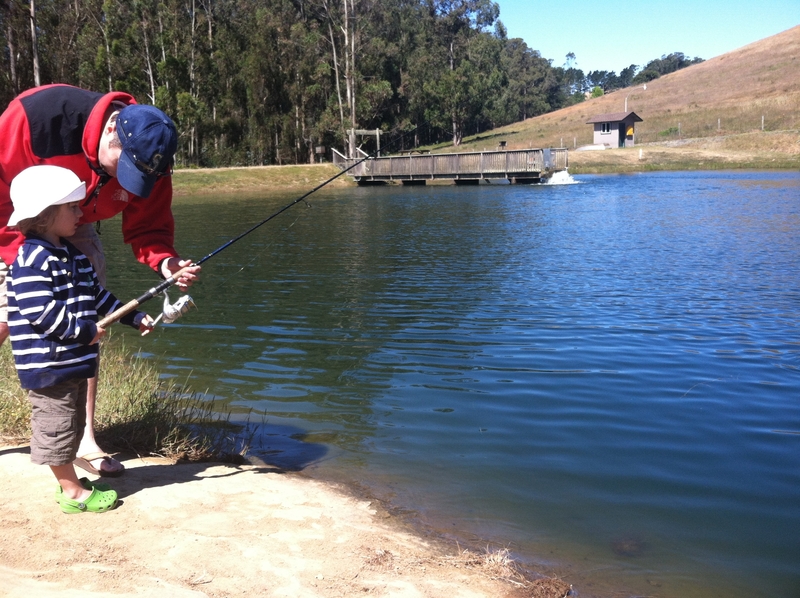 A trout farm provides a pretty fool proof way of providing a successful first fishing experience. In fact, it seems pretty impossible not to catch a fish. So, off we went to Hagemann Ranch in Bodega Bay. This place is worth the drive. Boasting two ponds, docks and little nooks and crannies, it was perfect. Add to that, the convenience of rentable fishing poles and license free fishing, it’s the ideal destination for first time fisherman (and parents too). So, we rented three poles, bought some worms and were off to fish. As we walked down to the pond, I was a little skeptical and wondering how long it would take Bobby to catch a fish. Within minutes, Bobby had picked a little spot near the water. Daddy cast the line, it was game time. But before I could even start thinking twice about how long it would take and before any other poles were baited up and cast, Bobby had caught a fish. Squealing with joy, he danced up and down as he saw his prize. His little brother, CJ, celebrated by pointing and grunting. Success! Then, it was time to cast again. Cast after cast, Bobby caught fish after fish. Within a half hour, he caught 5 fish. I never thought I would hope the experience would take longer. So, we packed up, and had them clean the fish. On the way out, the boys enjoyed some gummy worms. Bobby laughed as he pretended to be a fish eating the worms. It could have been the sugar, who knows, but the little gummy worm fish dance was priceless. With time to spare, we ventured into a neighboring town to grab some homemade ice cream at Screamin Mimi’s . For you locals out there, this place is worth a stop. From the festive decor to the mouthwatering treats, it’s a delight. I highly recommend the Mimi’s Mud, which is coffee ice cream blended with fudge and cookie love. Total bliss! After loading up on sugar, we brought our fish home, stuffed them with rosemary and grilled them over charcoal. Of course, we let Bobby relive his first “fish story” and tell us all about how he caught fish after fish after fish. The perfect ending to a (nearly) perfect day. This entry was posted in adventures, day trip, sonoma and tagged Agriculture and Forestry, Aquaculture, Aquatic Animal Producers, Business, Camping, Caught, Fish, hagemann ranch, Trout on June 17, 2013 by Modern Mama.